I fished practically all day and finished up with one red at about 4:30 yesterday. Skunked today off LA1. and TP i had seen some vids of people bank fishing there, never been but image its like Golden Meadow area towards catfish lake couple deep holes and everything else shallow? Very low salinity. Couldn’t taste hardly any in the water. There were about 10 boats back there but none seemed to be catching. No bait anywhere in those canals or the lake either. I fished da roadside Thur and Friday and caught only enough to fry a batch. Lotttts of 10” throwbacks though. I really hope spring and summer are better than our winter. I’m out. Got my sons birthday this weekend. Yeah, fishing the rescheduled Minimalist Challenge in Leeville. 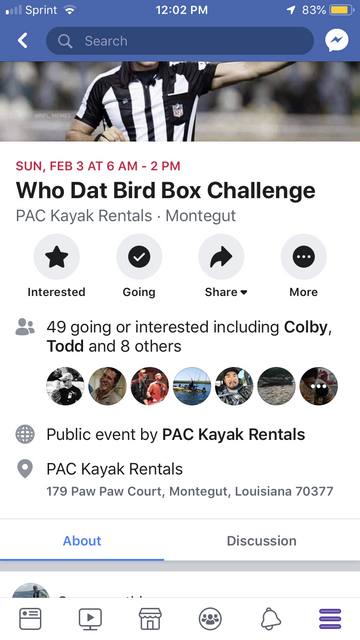 Are there any tournaments at PAC Saturday? That's weird they would put it on Superbowl Sunday. Good luck to everyone fishing it! They're doing it as an anti-Super Bowl thing. You seem familiar with this area. 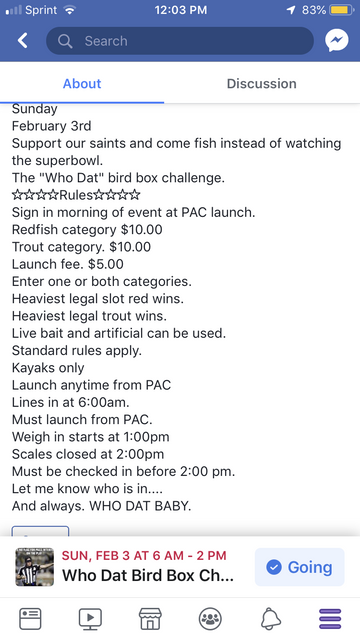 I just moved to NOLA and I am getting mixed messages on where I should go to fish. Someone recommended Myrtle Grove but I remember reading that it was all posted. Have you been to the Lake Hermitage area? Where is the high school in Port Sulphur located? I can't find a high school there. Does Happy Jack have a place to launch a yak? Are there other places I should know about along Hwy 23 for yak fishing? If you want to catch reds right now and maybe a few specks launch at the log cabins in hermitage. If you want to catch trout head to PAC. Where do I go at Hermitage? Do I go south in the marsh or North near the 3 camps?